Whether it’s being used inside or outside, the rotary laser level’s purpose is to help us determine and mark a consistent elevation for both building up or digging down. Here are the basics of how to use a rotary laser level like a Pro. Excellent work doesn’t have to be particularly fancy or sophisticated but it does have to be level, plumb, and square. After all, fancy work won’t look good if it’s cockeyed. Since you hope the guys before you kept things true—you’re on the same hook. As it often does, technology makes our lives easier in this area with rotary laser levels. 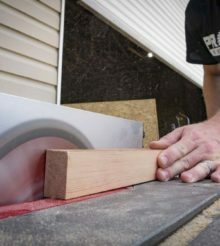 For this article, we used the DeWalt 20V Max Green Tough Rotary Laser for several reasons I’ll point out along the way. Using a rotary laser level inside is a bit less complicated than using one outside. Inside, our eyes can easily detect both traditional red lasers and newer, much brighter (and more expensive) green lasers. In fact, the DeWalt DW079LG delivers up to 250 feet of visible green lines inside. This visibility and range work well for installing tile, cabinets, handrails, backsplashes, window sills (especially for a line of windows), drop ceilings, and even floors. Laser levels can be mounted directly on a tripod, or you can set them on the floor or a table. Some come with magnetic mounts that work with steel. Others include drop ceiling mounts or ways to secure it to a wall via screws. A rotary laser level can be set on an object or mounted to a tripod. The self-leveling function means what it’s sitting on doesn’t have to be perfect. Most rotary lasers provide self-leveling within reason. Our DeWalt rotary laser self-levels up to 5 degrees. If you get it close to level, a pendulum or small motor system fine-tunes it to near perfection, usually within 1/16-inch per 100 feet. Once calibrated, the spinning head causes the single laser diode to make a 360-degree level line around the room. You can then use that line as a reference point for your measurements. The protective housing breaks up the projected laser, but only very small portions of the entire 360-degree line. If you’re getting toward the visible limits of your laser, match the color of your laser with enhancement glasses to see it even further. Most lasers include these glasses to aid visibility. Use glasses the same color as your laser to extend the visible range. Shouldn’t I Just Use a Cross Line Laser for Inside Applications? Many Pros turn to a cross line laser for inside measurements. A rotary laser level often bumps your accuracy from 1/8-inch to 1/16-inch and boosts your range. If you already have the more accurate tool, why not use it? Levels like the DeWalt 20V Max Green Tough Rotary Laser have a self-leveling mode for vertical lines as well as horizontal and plumb spots. And since the batteries in this one are rechargeable, it’s easy to grab and use. Cross line lasers, however, create a nice steady line since they utilize prisms instead of a spinning head. If wall color or lighting causes you to have to use a receiver inside with a rotary laser level, you may find a cross line laser more useful. You can use a rotary laser level inside, but a cross line laser often delivers a brighter beam. Since it’s steady rather than rotating around, it’s usually easier to see inside. When you use your rotary laser level inside, some models have controls to help you see better. The DeWalt DW079LG has settings for 15-, 45-, and 90-degrees. These constrain the beam to a smaller space. You can also adjust the speed. Faster RPMs equal a more solid line, but also a dimmer one. Our DeWalt DW079LG has controls on the laser and the remote to make a 15-, 45-, or 90-degree line for better visibility in smaller spaces. Rotary lasers also have a slope function—both X and Y axis in the case of DeWalt. You can use this function to cast a perfectly horizontal or vertical line at an angle above or below the laser on the X axis. The Y axis adjustments can give you a sloped line to work with when needed. Using a rotary laser level outside to determine elevation is a little more complicated but its usefulness far surpasses any added complexity. Due to the limitations of our eyesight and regulations regarding the strength and brightness of lasers, outside use requires a laser receiver mounted on a very large ruler called a transit – or grade – rod. The laser level, typically mounted on a tripod, levels itself after you get within its auto-leveling tolerance and then begins to emit the laser beam in 360 degrees. As you might imagine, the ground outside can be much more uneven than a finished floor inside, so some adjustment of the tripod legs is likely necessary. Mounting the receiver on a grade rod gives you the ability to get a benchmark elevation and compare it to other points on the jobsite. The laser receiver detects the laser emitted by the transmitter so you can determine elevations. Most receivers emit both audible and visual cues that indicate whether the receiver is higher, lower, or level with the laser to aid in the process. The most reliable way to use the transmitter and receiver combo is to calibrate them together at a close distance to establish a benchmark elevation. When the receiver indicates that it’s level with the transmitter’s laser, take note of the elevation on the grade rod. When you’re working where you can’t see the beam, you’ll need to use the receiver. Once the beam hits the target area (that green sensor on the right), it tells you if you should move the receiver up or down to line it up. For slopes, you can lock in a custom angle once your rotary laser is in position. From there, just use your transit rod and the receiver like you do on level ground to see how close you are. For example, let’s say the grade rod is level with the laser at 5 feet high. Now, you can determine if other areas of the site are higher, lower, or level with your benchmark by deducing the variance with the ruler markings on the grade rod as you move the receiver up and down on it. If you’re too low, you know you need to bring in more fill. Too high and you need to remove some. Here’s another example – we had the task of putting an addition on a 1920’s house along with a nearly complete remodel of the interior. With the back of the house completely exposed, we used our rotary laser level and receiver combination to see how far we had to jack up the house by checking different points on the existing floor. One side of the house was more than 2 inches off level with the other! With the receiver on our transit rod, initial calculations and checks along the way were quick and kept the work moving along. The laser gives us the ability to make accurate adjustments with the jacks so that the addition and remodeling will make the inside of the house look and feel brand new. Rotary laser levels like the DeWalt 20V Max Green Rotary Tough Laser are perfect for site work. This type of tool can ensure the ground will be level for foundations, construct grades for drainage, or bury utilities at a predetermined depths, and ensure water will flow in pipes. It’s essential for level foundations, fences, and overhead utilities. As we know, carpenters and masons rarely get to work on perfectly level ground for decks and patios. There are certainly many more applications as well. Whether used inside for the visible function or outside with a receiver and transit rod for true lines, a rotary laser level is an incredibly diverse tool for getting the job done. With added abilities like customizable slopes, it opens up functions for drainage, ramps, utility work, and much more. We hope you’ve benefitted from this How to Use a Rotary Laser Level Like a Pro article in our Training the Apprentice series. If you’re Pro and have some tips you’d like to share with aspiring tradesmen, add them in the comments below or hit us up on Facebook, Instagram, or Twitter! Accuracy: 1/16 in. per 100 ft. Range (indoor visibility): 250 ft.